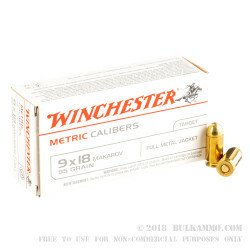 This Winchester "White Box" ammunition is perfect for Eastern pistol collector's who find their stash of surplus rounds running low. 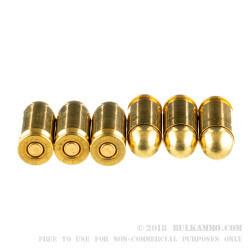 These 9x18mm cartridges are assembled using brass casings which are less harsh on hard-to-find claw extractors and suitable for reuse by frugal home reloaders. A Boxer primer at the base of each casing produces a non-caustic spit of flame that won't leave behind any metal-eating chemicals. Likewise, the casing houses clean-burning powder of Winchester's own formula for consistent muzzle velocity and reliable function. 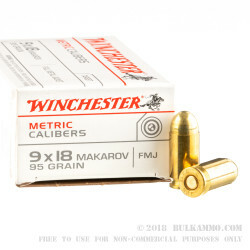 A 95-grain full metal jacket (FMJ) projectile graces the top of the load and matches the weight of the most popular 9x18mm loads, making it a perfect choice for target practice and sight evaluation. The bullet's smooth curvature provides dependable feeding in classic C&R blowback pistols with narrow feed ramps. 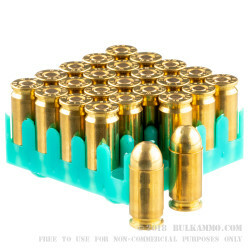 A modern gilding metal jacket precludes excessive lead buildup, allow shooters to get the most accuracy and longetivity out of their collectible Makarov or CZ-82 pistol. Winchester pours over 150 years worth of manufacturing experience into their products, resulting in accurate and cost-effective ammo for any purposepose.